Average Weight	: 65 - 90 lbs. There is no real agreement concerning the origin of this Franco-Belgian breed. The cattle-herders of the northern French hill country and southern-western Flanders needed a really rugged dog to guard, herd and drive their animals. The Bouvier des Flandres emerged as that dog. They are a rough and intelligent dog who was of help to the small farmer and the butcher alike. The itinerant strangers and packs of feral dogs who wandered those hills all needed to be watched and occasionally attacked ~ and the Bouvier was exactly the right dog for the job. This is a breed that isn't afraid of anything; clearly undeterred by all kinds of terrain, weather and boundless in their devotion to their owners ~ the Bouvier sets about their tasks with impressive skills and energy. This is a Breed that easily weighs in over 70 lbs. and during WWI served faithfully as an ambulance dog and messenger. Unfortunately WWI almost made this breed extinct. The areas that these dogs worked in were devastated by the battles that raged on from both sides. Most of the Bouviers were lost and the remaining dogs were taken back to Germany & Belgium to keep the breed alive. History shows one Bouviers belonging to a US army veterinarian turned out to be very special. His name was Ch. Nic de Sottegem and this dog went on to be the forebearer to many of the Bouviers we have on our shores here in the USA. Several breeds have been attributed to the development of the Bouviers including the Dutch Griffon, the Barbet and the Beauceron. The breed originated in Belgium by the working class who were not interested in creating a show dog, but rather wanted a working dog. Farmers, butchers and cattle merchants used the dogs in their everyday work. Bouvier des Flandres means "cowherder or oxherder from Flanders." The dogs were labeled several nicknames as well, such as "koehond" (meaning cow dog), "Vuilbaard" (meaning dirty beard) and "toucheur de boeuf" or "pic" (meaning cattle driver). Later they were used as a message-carrier and rescue dog during World War I. Some of the Bouvier talents are watchdog, guardian, tracking dog, guide for the blind, search and rescue, police work, military work, carting, agility, competitive obedience and Schutzhund. •	Intelligent, and hardy, very powerful. •	Excels in guard and watchdog abilities ~ very protective and territorial. •	A great family dog and will be great with the children within his family. •	Loyal, obedient and loves to rough and tumble. •	Not suited for apartment/condo lifestyles ~ better suited for the country or large properties. •	Not great with other dogs, as this breed was bred to drive away other animals and even kill. As a working cattle dog the Bouvier des Flandres needs to be calm, even tempered and very protective towards the herd. They are bold and fearless as well as courageous without the high prey drive associated with some of the other large dog breeds. They will protect their area and may have a tendency to become more protective or even nervous and timid if not socialized. They are known to be standoffish with new people but once they accept the person they will quickly adjust. The Bouvier is very intelligent and has the tendency to be somewhat independent at times. They can be dominant and do need to have someone that has experience with dominant breeds involved in their training and socialization. The breed is generally very easy to train and has a wonderful memory for commands as well as people, often amazing their owners with who they remember. The Bouvier des Flandres is a good watchdog and guard dog although they are not prone to aggression. Their sheer size and intimidating look is usually enough to keep unwanted people away. They are rather reserved and not an extremely playful breed once they fully mature at three years of age although they get along well with children. They are more of a companion dog rather than a playful dog, typically enjoying going for a walk or simply watching the kids play. The Bouvier can, when properly socialized, learn to get along with other pets although they are not recommended for houses with non-canine pets as they do chase. They will typically get along well with other dogs with socialization, however intact males will have more problems getting along with other intact males than neutered males will. It is recommended to neuter and spay the Bouvier unless being used in a breeding program to help with obedience and control of these large dogs and to prevent unwanted or unplanned pregnancies. As can be predicted from the history of the breed the Bouvier des Flandres has developed a high tolerance for pain as well as a very healthy and hardy constitution. They are not prone to many of the genetic conditions of many of the breeds likely to their selective and controlled Breeding. They are also not a high demand dog in many areas due to their size, making them less likely to be involved in puppy mills and backyard Breeding programs that have severely damaged other more popular breeds. Canine hip dysplasia (CHD) - common in all large breeds it is the degeneration of the hip joint resulting in decreased mobility and pain. Can be treated with drug therapies and surgery. Bloat - also called Gastric torsion, occurs in most deep chested breeds. Feeding several small meals and limiting Exercise immediately after eating can control this problem. Entropion - turning inward of the eyelids, usually the lower, resulting in irritation to the eye. Can be corrected with a surgical procedure. Grooming the Bouvier des Flandres requires a regular routine to keep the coat looking great and to minimize the amount of hair spread on the furniture and rugs. If groomed two to three times a week there will be little shedding, although in the spring and fall the grooming requirements will increase. The outer coat of the Bouvier des Flandres is very coarse and dry to the touch and is not prone to matting or tangling. The softer, denser inner coat is more prone to these conditions and care needs to be taken to make sure all debris and tangles are out of the inner coat. Groom with a pin brush or very stiff bristle brush grooming in the direction of hair growth. Since the two coats together provide protection for the dog it is not recommended to clip the coats however trimming the longer hairs on the beard, moustache and eyebrows is considered acceptable for the show ring. Slight trimming of the rest of the coat to accentuate the body and to tidy up the coat is also permitted and usually will only need to occur about once every three to four months. Avoid bathing the dog and only do so when absolutely necessary. They are a very clean dog and don't typically have the doggy smell, largely due to the resistant nature of the coat. Some allergy suffers have reported that they have little reaction to the Bouvier des Flandres but it is important to spend some time with the breed to see if this is true for the individual. Caring for the ears, especially in Bouvier des Flandres with the natural ears is important as wax and debris can build up causing infections. Pluck all long hair out of the visible inside ear area during grooming to help prevent wax build up. If you are uncomfortable with this a groomer can do this for you every three to four months when they are trimmed. Starting the young Bouvier des Flandres off with lots of exercise that is not too strenuous or exhausting is very important. The breed is slow to mature not reaching full size until about three years of age and during this time it is important not to over stress the puppy physically. Long walks, shorter jogs and lots of playtime are essential for the growing puppy. Teaching the Bouvier des Flandres to play when they are young is an excellent way to exercise the dogs and to help them stay playful while they mature. The Bouvier des Flandres, once fully mature, can handle lots of long, regular exercise. They can handle long jogs, hiking time and interaction with other dogs to provide regular and frequent exercise. The Bouvier des Flandres will also self-exercise if provided a large yard or space however they tend to be inactive if left alone in the house. The Bouvier need interaction with people to be happy and well adjusted so exercise provides a great opportunity. Although they are large they do love to go in the car and are ideal trekking and hiking pets, typically staying with the family and not roaming once trained. They are also good in most situations as they are not dog aggressive unless they are intact males with females present. The Bouvier can be taught to fetch as well as compete in obedience and even agility events. They are a very loyal and obedient dog and are naturals at these activities. Of course they can also be used as herding dogs should you live in a rural setting. Many owners train their Bouvier des Flandres in herding, an ideal way to combine exercise with obedience type training. Training the Bouvier requires that the dog bonds with the trainer or owner and understands that he or she is the boss. This means working with the puppy in very positive and consistent manners right from the start. Once the Bouvier des Flanders understands that the human is the leader, they are extremely affectionate, willing learners and very obedient in nature. 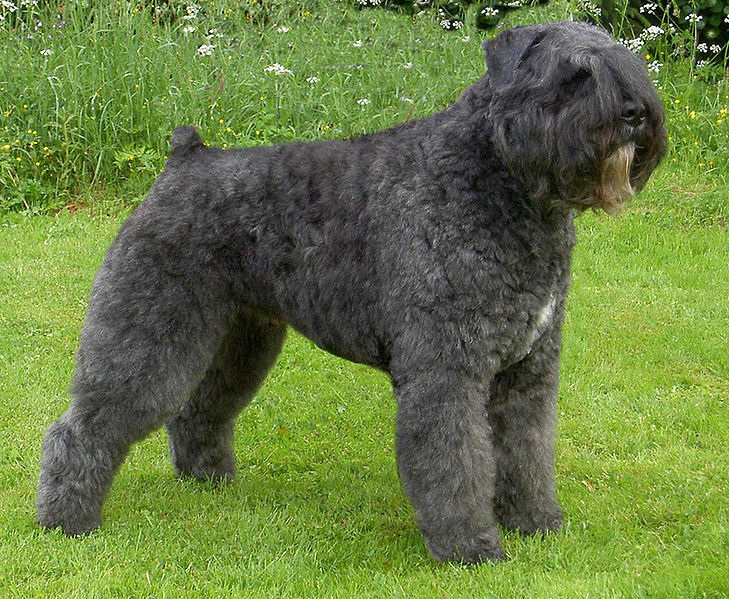 The Bouvier des Flandres is a naturally very clean dog and will typically learn the routine of house training within a very short period of time, often just a couple of weeks. They are also good both on and off the leash and can be trained to heel off the leash with little effort once they have passed the impulsive puppy stage. A large breed, they do not mature either physically or mentally until about two to three years of age and so trainers should keep in mind not to expect them to have really mature behaviors even though they are large in size at a young age. Obedience training and lots of early socialization is a requirement of the breed. They can be somewhat independent and headstrong through their teenage phase so consistency is important. They may also become protective and territorial so socialization is key for the breed. Training the Bouvier as a herding dog is a true pleasure. They are very astute and intelligent and will catch on to what the trainer is requiring very quickly and easily. They do require repetition of training until the command is mastered, but once they have it down they seem to never forget. The Bouvier des Flandres makes an ideal obedience show dog as well as an agility dog although their large size is often a bit of a challenge if they are not worked with at this event at a young age.